An exquisitely preserved wooly mammoth is currently undergoing an autopsy in Siberia. Some experts believe they'll be able to extract high quality DNA and cells from the remains which could conceivably be used to clone the extinct mammal. The question now is, should we? Back in May of last year, Russian scientists discovered the remains of the mammoth partially embedded in a chunk of ice at an excavation site on Lyakhovsky Island, the southernmost group of the New Siberian Islands in the Arctic seas of northeastern Russia. The samples were so amazingly well-preserved that fresh flowing blood was found within muscle tissue. 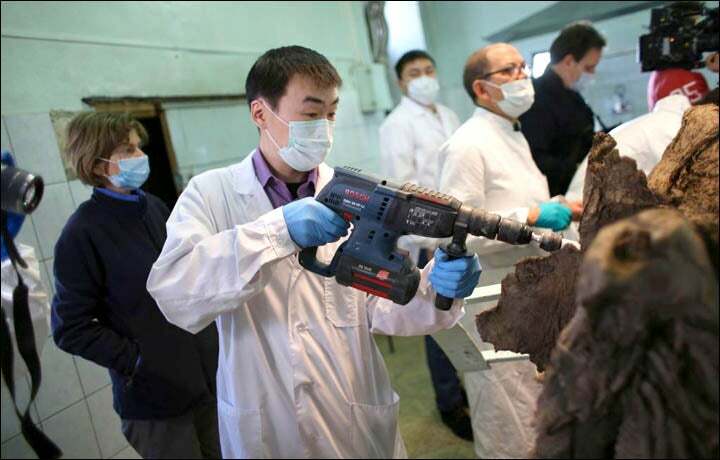 Now, some 10 months later, an international team of biologists are conducting a thorough autopsy in Yakutsk, capital of the Sakha Republic (also called Yakutia). The team is comprised of scientists from Russia, the UK, the USA, Denmark, South Korea, and Moldova. 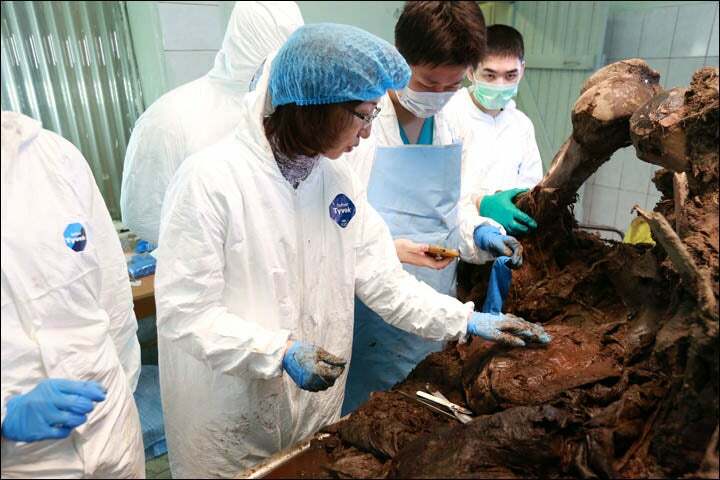 As reported by the Siberian Times, the scientists have dissected the mammoth, revealing 43,000-year-old soft tissue that's better preserved than those of a human buried for six months. The tissue cut clearly shows blood vessels with strong walls. Inside the vessels there is haemolysed blood, where for the first time we have found erythrocytes. Muscle and adipose tissues are well preserved. We have also obtained very well visualised migrating cells of the lymphoid tissue, which is another great discovery. The upper part of the carcass has been eaten by animals, yet the lower part with the legs and, astonishingly, the trunk are very well preserved. 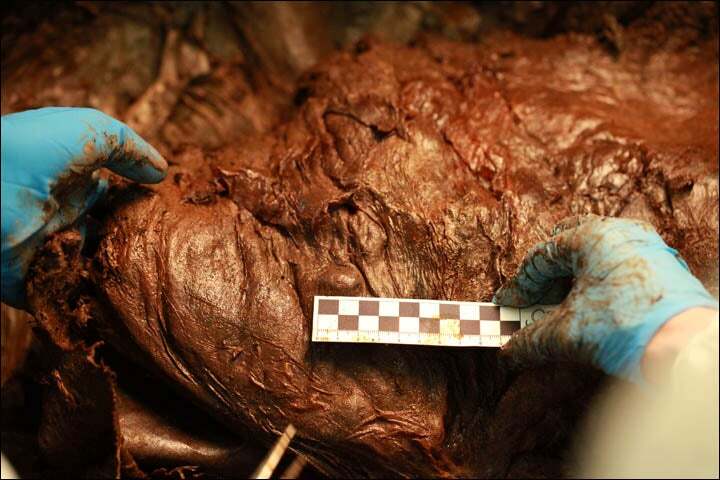 We also have the mammoth's liver — very well preserved, too, and looks like with some solid fragments inside it. We haven't managed to study them yet, but the first suggestion is that possibly these are kidney stones. Another discovery was intestines with remains of the vegetation the mammoth ate before its death, and a multi-chambered stomach what we've been working with today, collecting tissue samples. There is a lot more material that will have to go through laboratory research. A full report is expected in several months. Radik Khayrullin, the vice-president of the Russian Association of Medical Anthropologists, was quoted as saying "The data we are about to receive will give us a high chance to clone the mammoth," adding that "we must have a reason to do this, as it is one thing to clone it for scientific purpose, and another to clone for the sake of curiosity." Despite the optimistic words, the scientists have yet to uncover the most critical element to cloning: actual living cells. If they can find some — and that's still a big if at this point — they'd have to inscribe them with the mammoth's genome. And indeed, the biologists are currently searching for the least damaged snippets of DNA, and most especially nuclear DNA, to create a "working" wooly mammoth genome. Assuming both these elements can be found, molecular biologists could begin the arduous task of of trying to culture germ cells from a wooly mammoth. Once this is done, they would begin to manipulate the genetic code in a kind of "cut-and-paste" process, replacing segments of elephant DNA with synthesized segments of wooly mammoth DNA until the cell's genome matches the working mammoth genome. They'd likely use George Church's MAGE (Multiplex Automated Genome Engineering) technique to do it. This would likely be a protracted process given that the evolutionary path of wooly mammoths and elephants diverged a long time ago. Following that, the next step would involve a relatively well-established process. Scientists would splice these living cells into an elephant embryo, thus creating a chimera. A female elephant would be implanted with the resulting embryo, eventually giving birth to a veritable wooly mammoth. It's worth noting that failure to find a living cell would not necessarily be a deal breaker. Eventually, biotechnologists may be able to create such cells from artificial DNA — but that could be decades off. Sure, But Should We Do It? This is not an easy question to answer as there are many factors to consider. There's no doubt that the scientific insights gleaned from such a project would be tremendous. It's already offering scientists the opportunity to completely decode the DNA of the mammoth and decipher its DNA, which packs a lot of information. Assuming we could clone a wooly mammoth (or any extinct animal for that matter), the process would not only help us refine our cloning and reproductive technologies, it would offer us an unprecedented glimpse into the finer workings of an animal that's been extinct for 10,000 years — both from a genomic and morphological perspective. We would be able to study a living, breathing wooly mammoth. Scientists could study how it develops and how its behavior might differ from that of extant elephants. That said, a cloned wooly mammoth would (1) not be "socialized" in the same way its ancestors were, and (2) it would not physically (and even epigenetically) develop the same way it ancestors did given its likely environment — a laboratory setting. As for the whole de-extinction idea, I'm quite skeptical. Most, if not all extinct animals, are gone for a reason. Many predators have been hunted to extinction, a problem still faced by today's dwindling number of large carnivores. But in most cases, now-extinct animals were victims of habitat loss — a severe problem that's confronting many of today's extant animals. 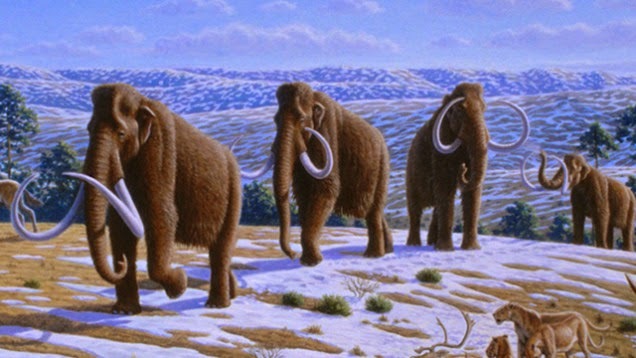 Given that wooly mammoths were ice age creatures, would there even be a natural home for them in this era of global warming?